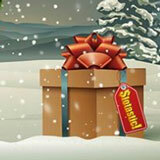 There are two things a slots player wants for Christmas and Slotastic Casino has them both: free money and free spins. Until Christmas new players anywhere in the world can claim a 150% up to $300 match bonus and get12 free spins on The Naughty List, the new Christmas slot game from RTG. The coupon code for the 150% Match Bonus up to $300 is 300FREE. After claiming that bonus you can get 12 Free Spins on The Naughty List with coupon code is XMAS12. These Christmas bonuses for new players are available only until New Year’s Eve. Later this month, December 15 – 19 all players can take free spins on other popular Christmas slots -- Santastic, Rudolph’s Revenge and Return of the Rudolph-- as well as 50 free spins on Enchanted Garden. You'll receive coupon codes by email for these daily free spins offers. Play designated Christmas games weekend in December and you'll earn Double Comp points, which can be redeemed for cash. Check your in-game messages or the casino’s Facebook page to find out the game of the day. The new The Naughty List is sort of a sequel to the Naughty or Nice slot that's been so popular at Christmas. It has two bonus features including a pick game where you select presents from under a Christmas tree to win free spins and bet multipliers The Lucky Feature can start after any spin, awarding up to a 10x multiplier. Slotastic Casino has a lot of online slot games from RTG but it also has table games like Blackjack and Roulette, all from Realtime Gaming.